"Finally a park building simulation on the XBox!" 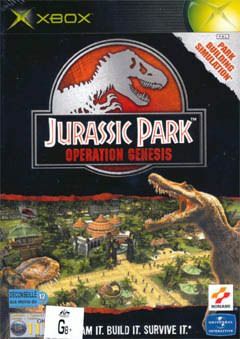 Jurassic Park Operation Genesis is the latest park building simulation from Vivendi Universal that borrows heavily from the Jurassic Park franchise and is the first game of its kind on the XBox. 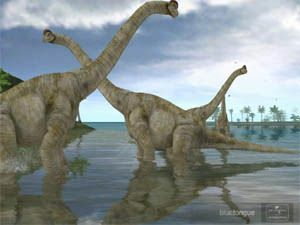 The idea behind Jurassic Park Operation Genesis (Genesis for short) is to build your own dinosaur theme park and hopefully make it become an international success. 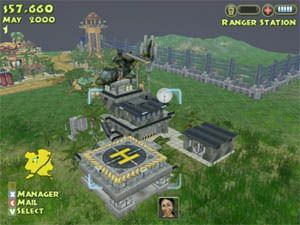 The developers at Blue Tongue have added a twist to the game and instead of just playing level after level, you must also play a variety of missions such as rescuing patrons and stopping dinosaur rampages. The basic layout of the game is an overhead view (similar to games such as Sim City or Rollercoaster Tycoon) where the gamer must create a theme park. 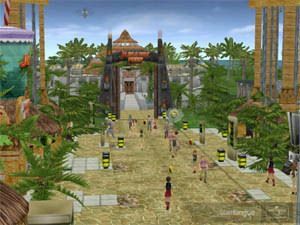 You basically start off with a blank slate (a jungle environment) where you must strategically place buildings, enclosures and a variety of other theme park type buildings in order for you to get your patrons to visit your park. Genesis also involves a micromanagement aspect of the game where you must excavate dinosaur fossils and hopefully recover their DNA in order to recreate them in the modern world. In order to do this, you must make profit from your existing park as the bigger the dinosaur you want to bring back, the more money it costs to genetically develop them. As with all good park building simulation games, you can adjust the prices of just about everything in the game from souvenirs to entrance fees to your park. Apart from the basics in the game, you must also organize suitably enclosures for your dinosaurs such as accommodating their eating habits and ensuring that your patrons are protected from these ancient beasts. As mentioned earlier, Genesis also offers gamers something completely different with the introduction of missions into the simulation world. This twist works quite well with Genesis and helps break the monotony of simulation games for one minute you may be designing your next big tourist or attraction or the other minute, you might be rescuing that rich millionaire who has wandered off the beating path. Graphically, Genesis is a very dull game and there isn't much detail in the game at all. The buildings lack detail and whatever texture details are included in the game are very sparse. Fortunately the models of the dinosaurs look quite impressive and are actually fairly well animated. With games such as Command & Conquer Generals and Warcraft III, you would think the XBox would be capable of going that one step further. The sound effects of Genesis contain all the growls, roars and screams of dinosaurs that you would hopefully expect to hear in a real theme park. Of course no one knows what a real dinosaur sounds like but Blue Tongue have done a great job of recreating sounds that suit the dinosaurs perfectly. There are also a variety of other background noises such as the voices of patrons (provided you have zoomed in enough), the sounds of vehicles, weather and various other background noises that come together perfectly. The orchestrated soundtrack of Genesis is brilliant and sounds just like out of the Jurassic Park movies, fortunately there is quite a bit of variety in the game, so nothing will become too dull. In conclusion, Jurassic Park Project Genesis seems like a ported PC game because of the graphics and gameplay and although there is no mouse on the XBox, the developers have done an extraordinary job at minimising the control system on the XBox that it actually feels quite playable. This is a first on the XBox and I would recommend this game to anyone who owns a XBox and misses a park building simulation for there is nothing better than this on the market at the moment. Check it out!